Are you looking for a service that combines the efficiency and convenience of a professional caterer with the appetizing appeal of a high-quality restaurant? When you call Saites Bros. Caterers, you get the best of both worlds. We provide catering for every budget and every occasion, so let us help you plan your party’s catering today! Includes trays of ham, beef and turkey, assorted sliced cheese and breads, condiments, your choice of salad or soup, chips and choice of beverage. Includes your choice of whole wheat, white or an assortment of buns stacked with ham, beef and turkey, condiments, your choice of soup or salad, chips and beverage (sandwiches available on croissants). Menu with croissants add $0.50 per person. Includes large 6” deli buns filled with lean ham, turkey, salami, provolone cheese, lettuce and tomato, your choice of soup or salad, chips and your choice of beverage. Flaky, buttery croissants filled with your choice of tuna salad, chicken salad or crabmeat salad. Includes your choice of salad or soup, basket of chips and a beverage. Menu with shrimp salad add $0.50 per person. Thin strips of beef or Pulled Pork in our own Bar-B-Que sauce served with fresh bakery buns, your choice of salad or soup, chips and choice of beverage. Thin slices of beef served hot in it’s own juice. Includes tray of fresh bakery sub buns and hot Au jus to dip your sandwich in, your choice of salad, chips and beverage. Includes trays of ham, lean corned beef and pastrami served with sliced natural Swiss and cheddar cheeses, whole wheat, dark and light rye breads, condiments, choice of salad or soup, basket of chips and choice of beverage. Made from fresh ground beef and our own special family recipe, your choice of salad or soup, chips and choice of beverage. Includes your choice of tomato, spinach, wheat or white wraps filled with your choice of turkey, chicken salad, tuna salad, ham and lettuce, cheese and tomato, your choice of salad or soup, chips and choice of beverage. Boneless breast of lightly seasoned chicken served in a mild creamed chicken stock and wine sauce with fresh sliced mushrooms. Includes seasoned long grain and wild rice, choice of salad or vegetable, dinner roll with butter and beverage. Bite-sized cubes of beef sautéed with sweet Bermuda onions and fresh mushrooms served in a rich brown sauce flavored with a hint of wine. Includes buttered egg noodles, choice of salad, vegetable, dinner roll with butter and choice of beverage. Boneless breast of chicken served in a sweet & sour marinate with fresh pineapple. Includes fluffy white rice, choice of salad or vegetable, dinner roll with butter and beverage. Atlantic white fish, buttered, seasoned and baked, garnished with lemon wheel and chopped parsley. Includes choice of salad, buttered parsley potatoes, dinner roll with butter and beverage. All white meat of turkey, sliced and layered over crisp broccoli spears generously covered with Mornay sauce. Includes rice pilaf, choice of salad, fresh baked muffin with butter and beverage. One quarter plump piece of chicken sautéed and browned in a honey, lemon and orange marinate. Entrée baked and served with peach halves and your choice of walnut stuffing or rice, choice of salad or vegetable, dinner roll with butter and beverage. All white meat of turkey served with walnut stuffing, whipped potatoes with giblet gravy, choice of salad or vegetable, dinner roll with butter and choice of beverage. One quarter piece of tender chicken, seasoned with walnut stuffing, whipped potatoes with giblet gravy, choice of salad or vegetable, dinner roll with butter and choice of beverage. Boneless breast of chicken basted in a lemon-butter sauce and seasoned with oregano and a hint of garlic, served with rice pilaf, choice of salad or vegetable, dinner roll with butter and a choice of beverage. Chicken breast stuffed with sliced ham and Swiss cheese, rolled in bread crumbs seasoned and lightly splashed with velouté sauce. Served with choice of salad, seasoned rice almondine, vegetable, dinner roll and butter and choice of beverage. 10 oz. cut of choice rib roast of prime beef seasoned and oven roasted to perfection. Served in its own natural juices. Includes, choice of salad, baked Idaho potato with butter and sour cream, vegetable, dinner roll with butter and choice of beverage. Our special recipe meatloaf served with whipped potatoes and gravy, choice of salad or vegetable, dinner rolls w/butter and beverage. Build your own tacos from seasoned ground beef, taco shells, cheese, diced tomatoes, shaved lettuce, sour cream and taco sauce. Buffet includes 2 choices of the following: fresh fruit salad, Mexican fiesta rice or refried beans and choice of beverage. Grilled strips of white meat chicken, green peppers and onion seasoned with our own southwestern blend of spices, served with flour tortillas, sour cream, salsa sauce and guacamole, grated cheese, tomatoes and lettuce. 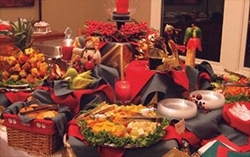 Buffet includes Mexican fiesta rice, fresh fruit salad and choice of beverage. Build your own taco salad includes fresh mixed greens with seasoned ground beef and ripe olives. Side dishes of grated cheese, tomatoes, sour cream and salsa. Served with fresh fruit salad, tortilla chips and choice of beverage. Layers of corn shells, seasoned taco meat, cheese and served with diced tomatoes, lettuce, sour cream and salsa. Buffet includes fresh fruit salad, Mexican rice and choice of beverage. Your choice of one of our hearty homemade soups with crackers and a mini salad bar with tossed salad of mixed greens four dressings, bacon bits, croutons, cheese, choice of diced turkey or ham, tomatoes, green peppers, mushrooms and cucumbers, sliced French bread with butter and beverage. Build your own salad, mini salad bar includes tossed salad of mixed greens, four dressings, bacon bits, croutons, cheese, choice of diced turkey or ham, tomatoes, green peppers, mushrooms and cucumbers. Buffet includes baked potato with sour cream, butter and your choice of fixings, dinner rolls with dairy butter and choice of beverage. Tender chunks of beef or chicken served with crisp cuts of celery, onion, carrots, Chinese vegetables and sliced mushrooms. Includes fluffy white rice, choice of salad, fresh baked muffins with butter and your choice of beverage. Chunks of stir fry pork or chicken in an oriental sweet & sour sauce with pineapple, green pepper and orange pieces. Entrée is served over fluffy white rice with choice of salad, fresh baked muffins with butter and your choice of beverage. Sauteed strips of sirloin beef blended with fresh green pepper, onions and seasonings in a tomato sauce, includes fluffy white rice, choice of salad, dinner rolls with butter and beverage. A delicious blend of eggs, Swiss cheese, chives, cream, bacon, broccoli or spinach in a pie shell. Includes a fresh fruit salad, fresh baked muffins with butter and a beverage. Bountiful chunks of beef served in its own rich gravy with fresh cut vegetables of carrot, potatoes, celery, onion and garden peas. Includes fluffy hot biscuits, choice of salad and choice of beverage. Chunks of chicken and fresh sautéed mushrooms, served in a rich chicken gravy. Includes fluffy hot biscuits, choice of salad or vegetable and beverage. Tender chunks of pulled chicken served in its own rich gravy with fresh cut vegetable of carrots, potatoes and garden peas. Includes fluffy hot biscuits, choice of salad and beverage. Slices of baked ham served with creamy old fashion scalloped potatoes. Includes your choice of salad or vegetable, dinner roll with butter and beverage. Ground beef with rice, green pepper, tomato and seasonings rolled in tender cabbage leaves, covered with our own rich tomato sauce. Entrée is served with buttered parsley potatoes, choice of salad, dinner rolls with butter and beverage. A delicious blend of mostaccoili pasta in our own rich ground beef, blended cheeses and seasoned tomato sauce with fresh sliced mushrooms covered with mozzarella cheese. Includes choice of salad, Italian bread with butter and beverage. Layers of pasta, ground beef, ricotta, mozzarella and Parmesan cheese baked in our own tomato sauce. Includes choice of salad, Italian bread with butter and choice of beverage. A bountiful supply of buttered spaghetti noodles and your choice of our own rich Italian meat sauce or marinara sauce. Includes choice of salad, Italian bread with butter and beverage. A blend of spaghetti and our own Italian meat sauce en casserole smothered with lots of mozzarella cheese. Includes your choice of salad, Italian bread with butter and beverage. Baked 6 oz. boneless breast of chicken covered with our own Italian sauce and topped with melted cheese. Includes choice of salad, vegetable, Italian bread with butter and beverage. Spicy Italian meatballs served in our own rich tomato sauce. Includes side of spaghetti, choice of salad, vegetable, Italian bread with butter and beverage. Fettuccine and grilled chicken in a rich sauce prepared with butter, cream and parmesan cheese. Includes choice of salad or vegetable, Italian bread with butter and beverage. A mix of baby shrimp, crisp garden vegetables and linguine noodles tossed in a creamy Alfredo sauce. Entrée served with your choice of salad, Italian bread with butter and beverage. Stuffed Manicotti pasta with ricotta cheese, parmesan and fontinella cheese, mozzarella cheese, seasoned with scallions, oregano, basil and a hint of garlic. Covered with our own rich Italian tomato sauce and mozzarella cheese. Served with Chef’s tossed salad and dressings, Italian bread with butter and beverage. Price includes all tables set with silver flatware, linen napkins, salt and pepper shakers. A china dinner plate and salad plate is provided at buffet table. Price includes additional labor costs. Price includes all table pre-set with silver flatware, linen napkins, salt and pepper shakers, china dinner plate, salad plate, dessert plate, stem winter glass, roll baskets and plastic coffee mug. Prices include additional labor costs. Wait Staff is provided at all large functions that require it, for a three hour period at no additional charge. However, we do charge for any time over that limit. We also charge a labor charge for wait staff if the host of any event wants wait staff present when we usually would have no one there or if the host of the event required additional wait staff we ordinarily would not provide. A $45.00 gratuity charge will be added for each wait person on all china service parties. China service requires many hours of hard work by our wait staff and we feel they deserve a reward for their efforts.